At home after three marvellous weeks visiting gardens (and friends) in England, I find much to criticize in my garden. After many years of travelling, I’ve come to expect this — and to accept that a garden in Quebec’s harsh weather conditions will never resemble an English garden, with its lush foliage and flowers, topiary and ancient walls. I’ve also come to expect that gardens other than my own will disappoint me. On every tour I’ve hosted, there has always been one garden I particularly looked forward to seeing. On this trip, that garden was Boughton House, in Northumberlandshire. 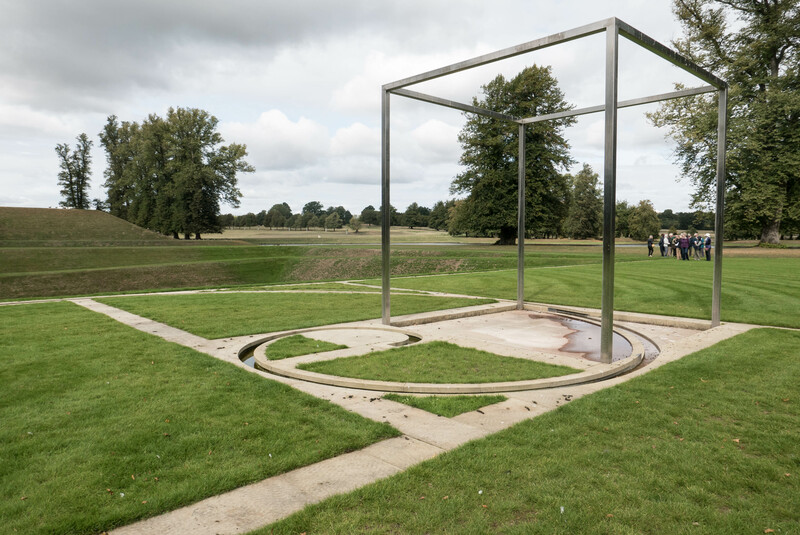 It wasn’t the flowers or the historically significant 18th landscape that was the big draw, it was Orpheus, a contemporary work of art by the English landscape architect Kim Wilkie. I’ve seen Wilkie’s landforms at Great Fosters, near London, and at Longwood Gardens in Pennsylvania. At both I admired the clarity of form, the precision of line, and the effectiveness of the work in its setting. 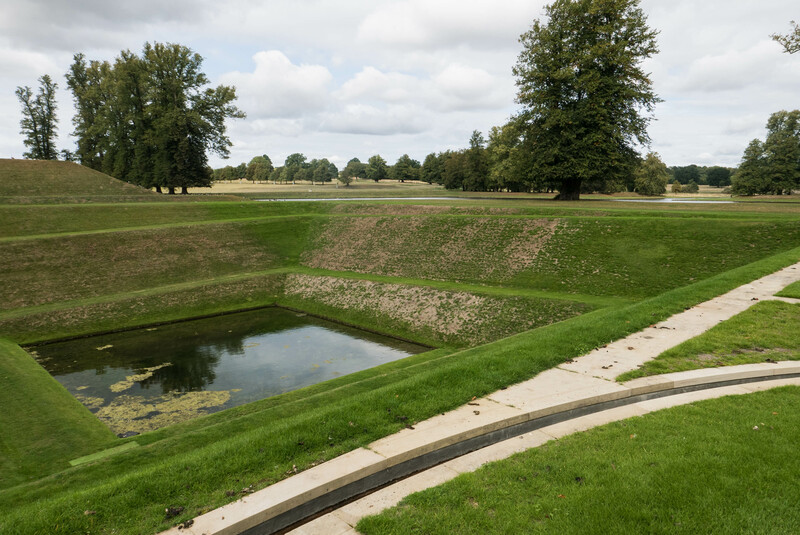 This admiration made me eager to see Wilkie’s work at Boughton, where a pyramid, inverted to descend underground, mirrors the shape and proportions of an 18th century mound nearby. 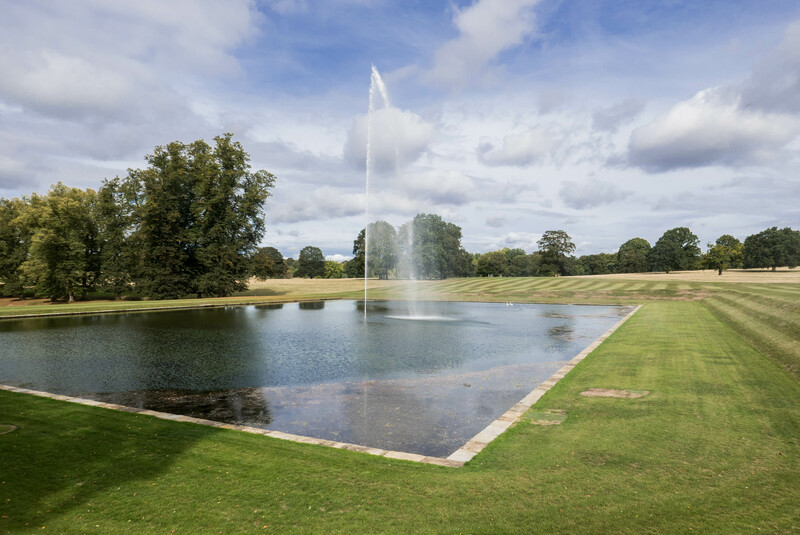 The 18th century garden is superb and the restoration of the fountain and the Grand Etang fittingly grand for a house built along the lines of Versailles. The fountain that works via remote control rises 70 feet into the air. On a sunny day it is beautiful to see. Orpheus, however, left much to be desired. The original gardens date from 1684, when John, the first Duke of Montagu, laid out a design based on the golden ratio, the golden spiral and golden sections. (There are many explanations of this idea on-line.) 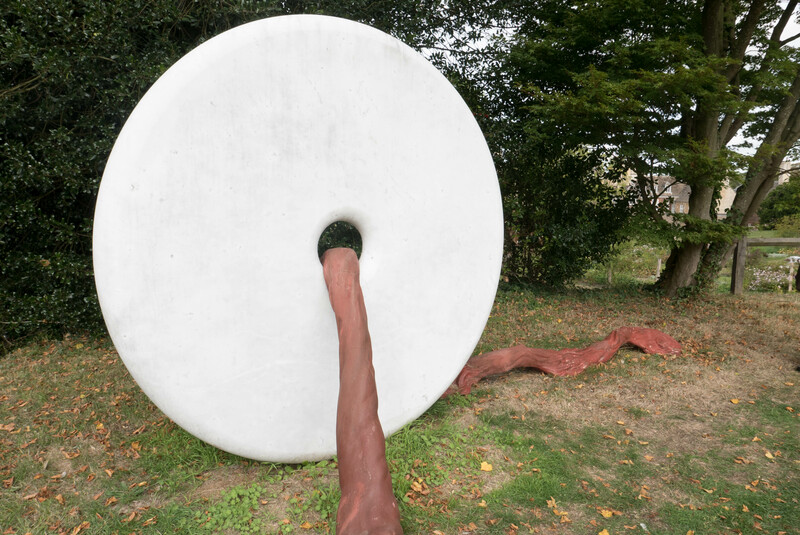 Wilkie used the same principle for Orpheus, and conceptually the project is brilliant in the way it relates the new, both to the old and to the surrounding landscape. Orpheus, only partly visible, echoes the shape of The Mount behind it. 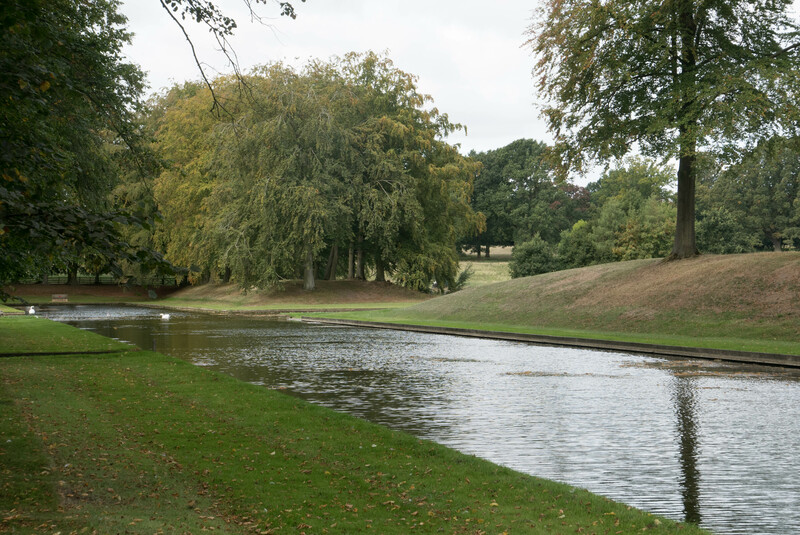 By naming the earth work Orpheus, after the mythological Greek musician who rescued his wife Eurydice from the underworld through the beauty of his music, Wilkie connected the contemporary work to the Enlightenment ideas that formed the basis of the garden’s original design. Using the proportions of the adjacent Mount, he created a massive 160 square foot inverted grass pyramid with a sunken pool at the bottom. 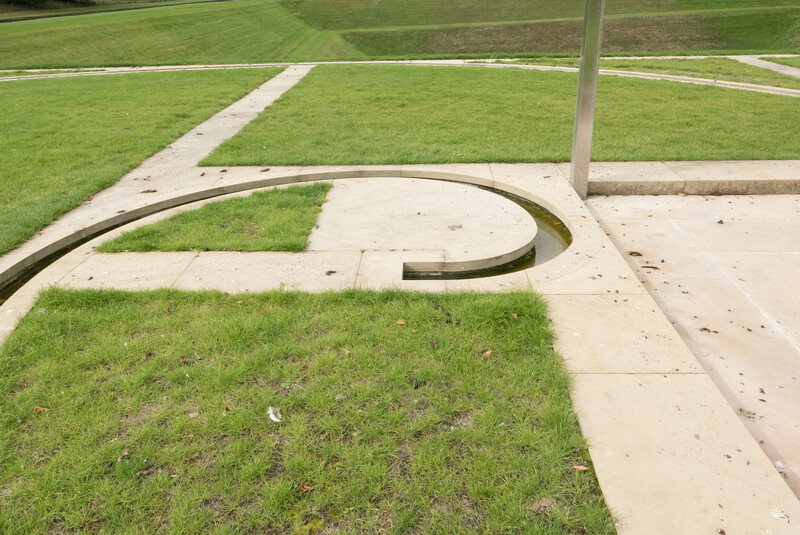 At ground level he added a stone rill and a series of grass sections that follow a golden spiral. Finishing the project he placed the outline of a cube, creating negative space above as he had created negative space below. So why was Orpheus a disappointment? First, I couldn’t really see it. To appreciate the design, I needed to see it from above. From ground level, the idea is clear but the impact is absent. Could I have climbed the Mount? Possibly, but whether through on-site restrictions or lack of time, that didn’t happen. I liked the colour contrast, white against green. Second, too many technical aspects fell short. The lines of the grass banks, so important to the design, were clean and sharp but bare patches of ground were distracting. So was the algae marring what should have been clear, reflective water. At the bottom left of the photo is another distraction — a metal man-hole cover. It may be necessary but its presence spoils what should be a pristine form. This summer in England was particularly dry, and a lack of rain could explain why the grass has not grown well. But it does not explain the condition of the stone rill, besmirched by bird droppings. Most troubling was the absence of moving water in the rill itself. According to our guide, the water is rarely turned on for fear that the sunken pool will overflow and create additional problems for one side of the pyramid where an underground spring has already caused the bank to slip several times. Standing water beneath the cube suggests that the surface is not perfectly level. I wanted to fall in love with Orpheus. The photographs I had seen of it told me I would. But I didn’t. Nor did I react positively to Life Force by Angela Connor. The brownish red cord which is meant to suggest a vein surfaces several times along the top of an old stew pond. I wish all of it had remained hidden underground. As for the flowery bits in the garden, the less said, the better. The up-turned stumps that appeared in several places felt arbitrary and out of place in the Walled Garden. The visit was far from a disaster, though, as other parts of Boughton’s landscape delighted me. I liked the serenity of the canal that stretched alongside an avenue of ancient trees. The 18th century canal was re-lined not long ago as part of a restoration project that began in 1975. A new grove of trees, where youngsters stood in orderly rows alongside grandparent trees, filled me with admiration. Will the grandparents be replaced by another generation as they themselves begin to fail? The levels of light and shade changed constantly on the day we visited Boughton, creating atmospheres that were alternately lively and serene. The tree-lined view that stretched out to tomorrow was beautiful in its simplicity. 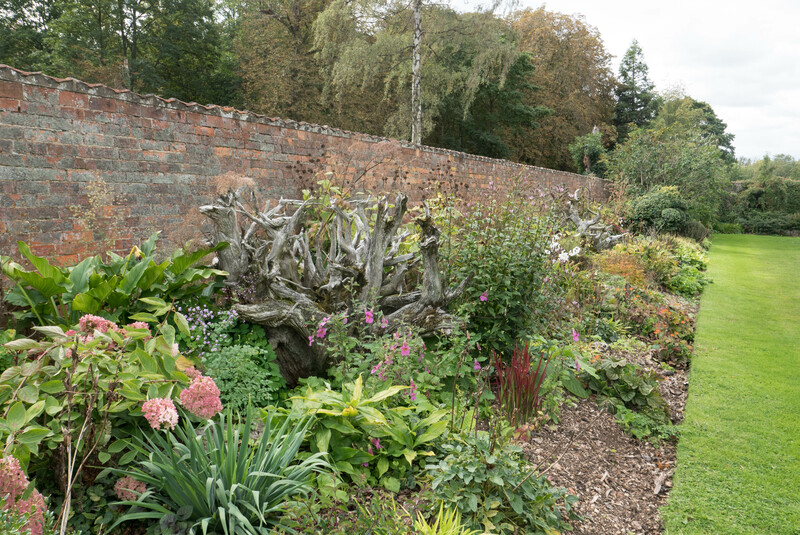 This aspect of the garden underlined the long-term commitment made by the 9th and 10th Dukes of Buccleuch to rejuvenate this ancestral landscape. 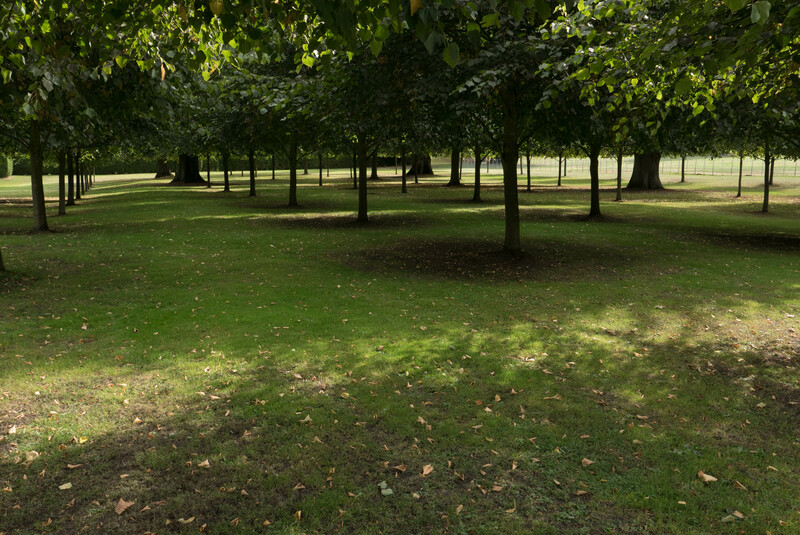 These trees are part of the two miles of lime trees that have been replanted since 1975. I admire enormously the restoration work going on at Boughton House. 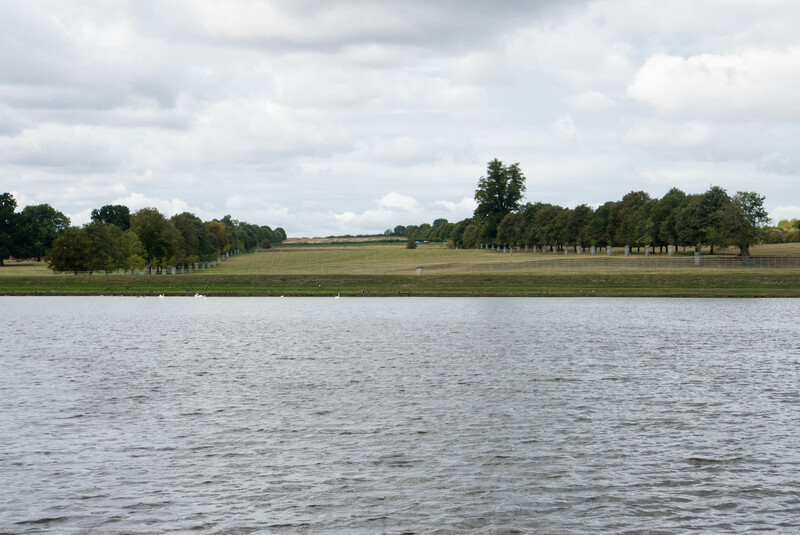 The scope of the work is daunting: formal areas cover 100 acres and there are an additional 450 acres within the original 15th century deer park. 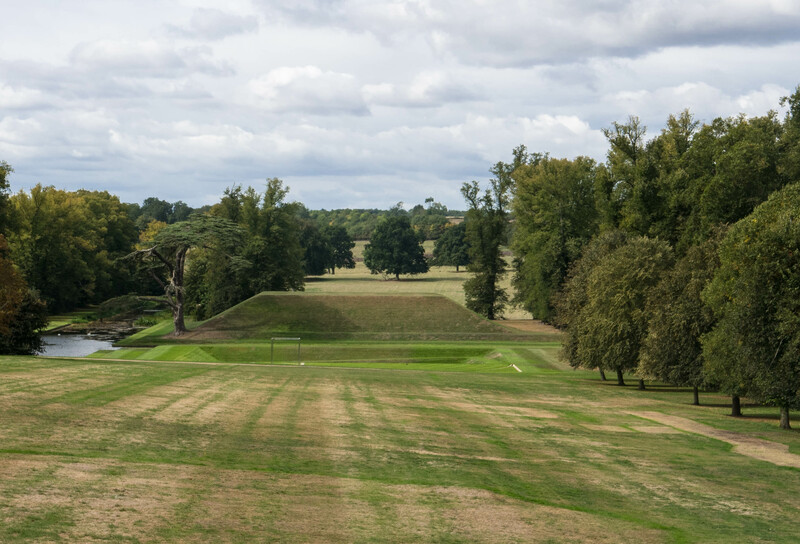 I admire equally the intention behind Wilkie’s Orpheus and the desire on the part of the current Duke of Buccleuch and his wife to add a contemporary edge to this magnificent setting. I only wish the reality of Orpheus matched its intent. Over the next few weeks I’ll review other gardens I visited on this tour. There will definitely be some hits — and at least one more miss. What about you? Have you visited a great garden recently? If you visited one that let you down, have you written about it? Evaluating a garden rather than simply describing it takes time and thoughtful consideration. It means looking at the designer’s intentions and deciding how successfully they were executed. 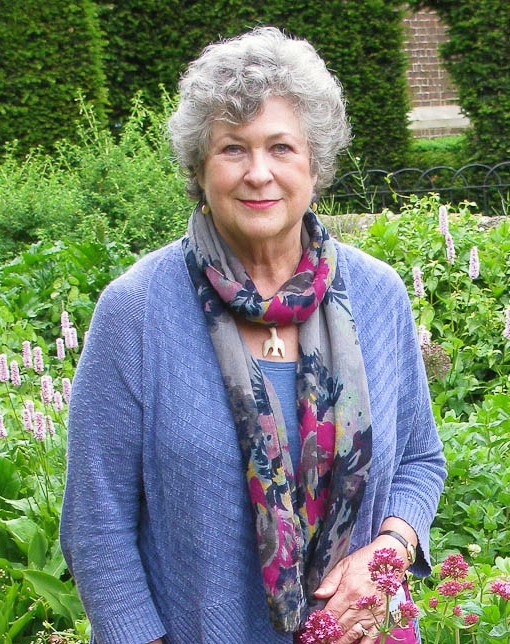 Sharing critical views means putting yourself on the line and taking gardens seriously. I think that is something worth doing.